1. To make the chocolate sauce, put all the ingredients into a small saucepan, heat gently, stirring until the chocolate has melted and the sauce is smooth. 2. Remove the core from the peeled pineapple and cut the flesh into chunks. Halve the nectarines or peaches, remove the stones and cut into thick slices. Cut the kiwi fruit into quarters. 3. 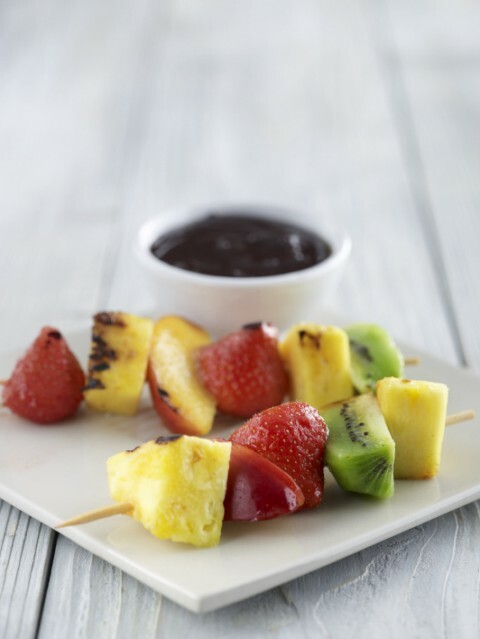 Thread the fruit onto skewers, brush with olive oil and dust with caster sugar. Place on a medium hot barbecue, cook for 5-7 minutes, turning to grill all over. 4. Serve with the chocolate sauce. Pineapple slices: Dry fresh slices of pineapple on kitchen paper. Brush with olive oil and sprinkle with caster sugar, then caramelise on the barbecue. Bananas: select firm bananas and barbecue in the skins until charred and soft to the touch. Offer rum to pour over the peeled bananas and a bowl of the chocolate sauce. 1. Break the chocolate into a bowl, place over a small pan of simmering water and allow to melt. Remove the bowl from the pan and let it cool to lukewarm. pale in colour. Whisk in the coffee, brandy and olive oil, then gradually fold in the melted chocolate. chocolate mixture until smooth, then add the rest of the egg white and lightly fold in, trying not to beat out the air. 5. Serve cold with fresh berries. 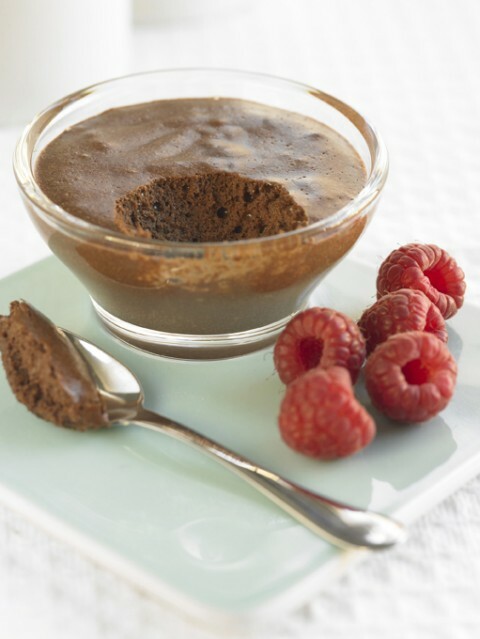 Sprinkle some extra grated chocolate or flakes of chocolate over the top of each mousse, for an extra touch of luxury. The hotel is located in the Puerto de Mogan, a beautiful fishing village also known as Little Venice to its visitors. It is just a few metres away from the beach and from the colourful fishing quay and the marina, all surrounded by the lush and vibrant Mogan Valley. London: Cocoa, the main ingredient in chocolate, is good for the circulation and eating it may reduce the risk of blood clots by improving blood circulation through the heart and brain. Cocoa, contains flavonols, naturally occurring antioxidants, which can help the body protect itself from the diseases of ageing, such as cancer and heart disease, by eradicating the free radicals that can damage arteries and blood vessels. Cocoa has already been credited with health properties that can improve blood vessel function and may reduce clot formation. The new research shows flavonol-rich cocoa improves blood flow which, scientists say, also lowers the risks of clotting. And eating chocolate can also make you very happy and help you live a longer life, say scientists. In November 1977, at 225 Faubourg Saint-Honoré, Paris, Robert Linxe gave material expression to his passion for chocolate by creating the first La Maison du Chocolat shop. This summer, La Maison du Chocolat on Piccadilly, is joining its 11 sister stores across the globe to celebrate 30 years of creating elegant, luxury chocolates. As part of this celebration La Maison du Chocolat is announcing some special additions. The new products available to buy now include the incredible Sevillane, indulgent summer tarts and summer bouchees and a special edition of the beautiful Macaron. The Ice creams and sorbets will be available from June. Inspired by the flamenco dancers of Seville, the Sevillane hosts a sensual explosion for the nose and taste buds through its five mouth-watering flavours and a variety of textures. Sevillanes dark chocolate ganaches come in four amazing flavours, mango, raspberry, exotic fruits and the forth is wild strawberries with fresh mint. A further fifth flavour is the praline with lemon zest. Every Sevillane box has its own cooler bag to protect the chocolates from the scorching summer expected in 2007. The Sevillanes delightful, peach and caramel coloured box is designed to open like a flamenco dancers fan and comes in two sizes, one for an indulgent or sharing mood and the other smaller box, for a more intimate moment. The La Maison du Chocolat cooler bags make the Sevillane and other summer products ideal for picnics in the Park and post-work Barbecues, shared with a loved one or friends over a lively Sauvignon Blanc. La Maison du Chocolats refreshing ice creams and sorbets are set to return this summer. This year, customers can enjoy the traditional flavours of summer with a chocolate ice cream, a chocolate sorbet, a vanilla ice cream, a caramel ice cream and a chocolate and lemon sorbet. As well as these familiar flavours three additional flavours have been created to celebrate the 30th anniversary of the company  an apricot sorbet, a raspberry sorbet and a mango and passion fruit sorbet. All are available to purchase and eat in store or take away as individual portions either in La Maison du Chocolats hand made crispy cones or with a spoon in a small cup. Larger pots are also available to take home, ideal for catering or dinner parties. La Maison du Chocolats creativity does not stop with chocolate and ice cream. Its unrivalled inspiration and energy for flavour is translated into its fine tarts and pastries which are hand made in store daily. The Sable tart is an excellent dark chocolate cherry ganache with real pieces of cherry available in individual slices for a personal treat or a larger tart suitable for four people to share. The Dacquoise tart is a vibrant dark chocolate ganache with a creamy apricot decoration, available as a whole tart suitable for four people. La Maison du Chocolat has created a beautiful summer macaron with fruit and chocolate based on the Andalousie chocolate made with a dark chocolate and lemon ganache, ideal for a secret treat at work or as a kind gift for a colleague or loved one. Celebrities who enjoy chocolates from La Maison du Chocolat include; Madonna, Julien MacDonald, Peaches Geldoff, Tamara Beckwith, Holly and Sam Branson, Lily Cole, Jamie Dornan, Sophie Ellis-Bexter and David Tennant. La Maison du Chocolates finest chocolate is freshly made in Paris and infused with natural flavours; no artificial ingredients are used. La Maison du Chocolat spend time creating their excellent ganache; experimenting with new flavours and techniques to perfect their creations. To create the ganache, La Maison du Chocolat take natural flavours; for example when creating the mint chocolate, the chefs at the atelier in Paris take fresh sprigs of mint and infuse them in hot crème for a matter of moments to delicately transfer the natural taste of mint into the rich liquid. The mint is then sieved from the crème and blocks of broken La Maison du Chocolat chocolate are added slowly to the crème to melt the beautiful mixture together. The ganache is nearly ready! All that is left is to gently cool the mixture on marble tables to make sure the chocolate is the correct depth and texture to ensure all La Maison du Chocolat is perfectly presented and tastes delicious. Different chocolate is used for the individual blends and recipes and uniquely tailored by the expert chefs. Los Angeles: Cocoa, the main ingredient in chocolate, is good for the circulation, according to scientists at the University of California. So eating some chocolate may reduce the risk of blood clots by improving blood circulation through the heart and brain. Cocoa has already been credited with health properties that can improve blood vessel function and may reduce clot formation. The new research shows flavonol-rich cocoa improves blood flow which, scientists say, also lowers the risks of clotting. The study is pubished in the Journal of Cardiovascular Pharmacology. Carl Keen, professor of Nutrition at the University of California, said their findings contradicted popular views about chocolate. ‘This news catches people off guard as it contradicts popular views: chocolate can actually be good for you when it’s rich in flavonols.